As we approach the holidays this year, I know that many of you have a big to-do list. At least, I do! Figure out who is hosting holiday meals, when they will be held, who is traveling where, and last but not least, gifts! Who to buy for, WHAT to get them, how much to spend, etc., etc. The list of things to figure out is long, I know! I’m a big fan of frugal gift-giving, especially making homemade gifts. This is particularly important if you are on a tight budget, as many are. However, if you are not so much a making-gifts type of person, there are still ways to make sure that your dollars go as far as possible. 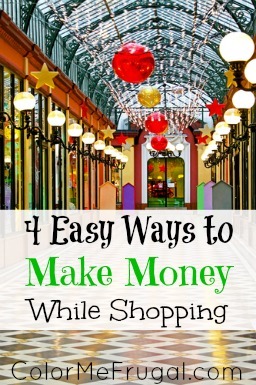 In fact, there actually ways to MAKE money while taking care of some of that holiday shopping! Do I have your attention now?? Check out some of these cool ideas for ways to make money while shopping for the holidays! Shop online through shopping portals. This is my favorite way to make money shopping! What are shopping portals? Basically, these are third party websites you can log into to shop at your favorite retailers such as Amazon, eBay, Wal-Mart, etc. Instead of going directly to a store’s website to purchase an item, go to a cash back portal like Swagbucks, Ebates, or Mr. Rebates and click through to the store you want to shop at through the portal. These portals offer you some sweet rewards for shopping there! For example, as of this writing, you can earn up to 7% cash back in rewards if you shop certain Amazon categories through Ebates. Every three months Ebates will send you a check for whatever you’ve earned in rewards from your online shopping. Pretty sweet, right? I often check out all three of these portals when I am shopping for big ticket items online, to make sure I am getting the best cash back deal that I can. Consider mystery shopping. Mystery shoppers literally get paid to shop at certain retailers if that retailer has requested it. If you are interested in mystery shopping, check out this post where my friend Brock gives some tips for success with mystery shopping. I haven’t done any mystery shopping recently, but when I did in the past I worked through Kern Scheduling and had a good experience with them. In addition to traditional retailers, mystery shoppers can also find gigs at places like movie theaters and restaurants. Date night, anyone? Be a personal shopper. There are folks out there who actually hire people for this! I don’t know of any websites specifically dedicated to this, but good places to look for personal shopping gigs are TaskRabbit and Fiverr. Also, since we are quickly approaching Black Friday I thought I would let you all know about a really cool resource that I heard about for Black Friday shopping this year! The good folks at the Penny Hoarder have launched a Black Friday portal this year. They are going to be doing an around the clock live blog for 48 hours (starting 3 p.m. on 11/25, ending 3 p.m. 11/27) where readers can ask anything they want about the holiday, such as: Store hours? Who has the best TV deals? Are there any Target coupons? etc. The word is that they’ve got 20 money-saving experts spending the night in the office, so they’ll be there to answer all of your Black Friday questions! 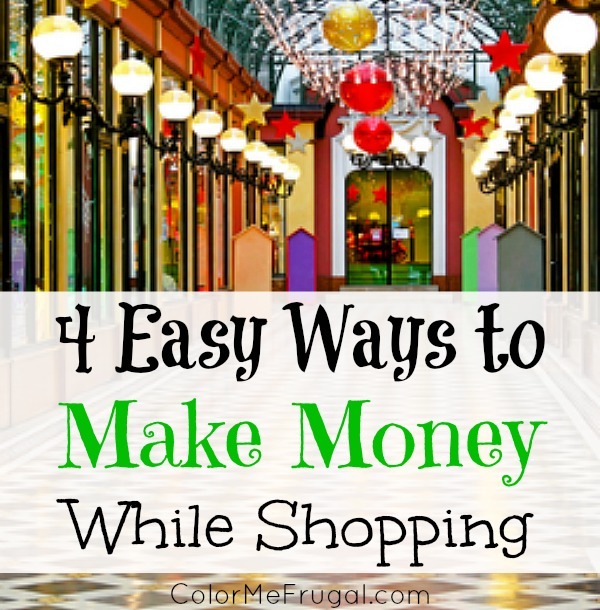 Have you used any of these ways to make money while shopping? Do you plan on shopping on Black Friday this year? One time a long time ago, I tried mystery shopping. I signed up for a bunch of places and they sent me all these emails for jobs. It can work as far as generating a tangible income. And you get to keep the stuff you mystery shop for sometimes. Not for everyone though 😛 I pinned this post btw, thanks for sharing. Jay, thank for pinning! I had a great time mystery shopping a few years ago when I kept getting hired to mystery shop a nearby movie theater. I went to dozens of movies for free, which was pretty fun since I rarely see movies otherwise! I need to be better about using credit cards to pay for things and then transferring the payment from my checking account right away. I’ve just been so focused on paying cash that I forget to take advantage of the rewards! I try to do that too. Especially if we have a big bill like a medical bill or something that needs to be paid for, I often pay with my card and then pay it off right away so I don’t have to worry about. Love those rewards! Being a Mystery Shopper sounds like a lot of fun. It would be a good early retirement job for someone who likes to be out & about in the stores. Thanks for the link to the great article. I think companies like to hire shoppers of all ages, so this could indeed be a great idea for someone of any age! I like using specific credit cards to purchase things when there is a cashback reward. This Christmas my card had a 15% cashback reward for a discount store where I can buy Christmas gifts. woo-hoo! 15% cash back is killer! Definitely gotta take advantage of that! !